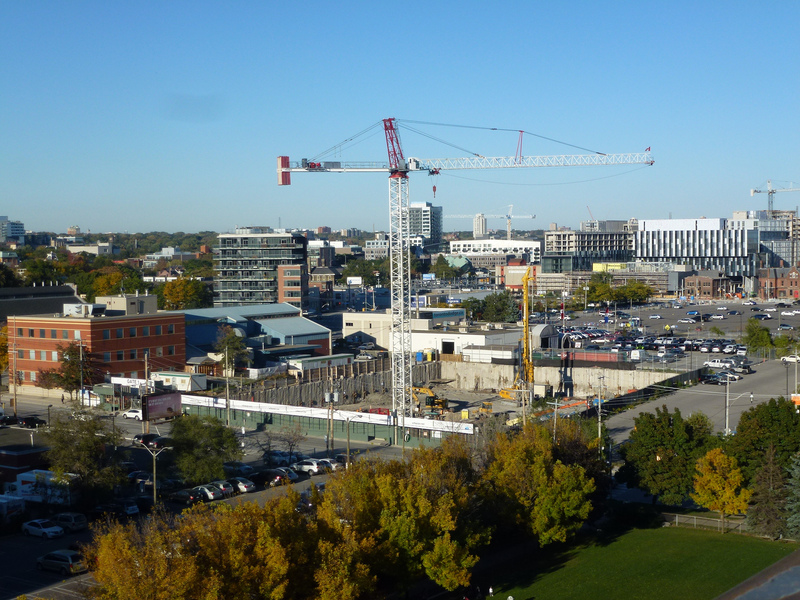 River City 3 is encircled by parks and green-spaces, like the lovely Corktown Commons. 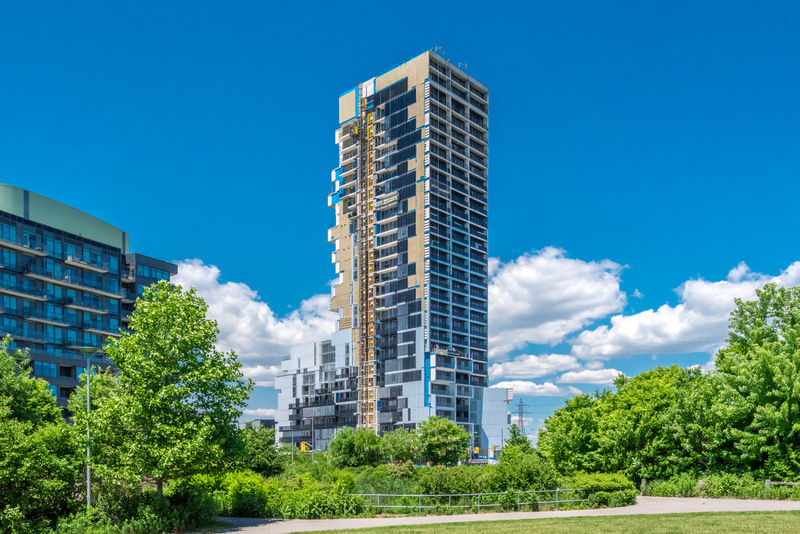 River City 3 (or RC3) is part of multi-phase condo development in the West Don Lands. Winner of multiple BILD Awards, including Best Design and People’s Choice, it’s one of Toronto’s most imaginative buildings. 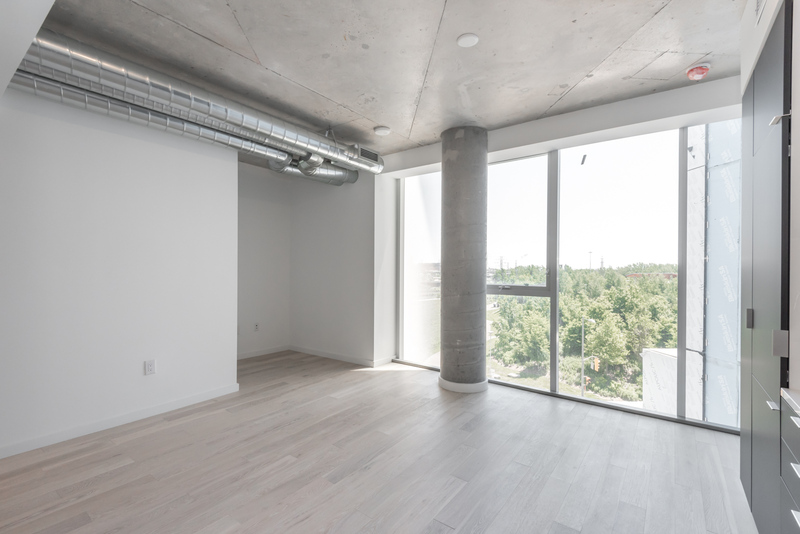 Minutes from downtown Toronto and surrounded by parks, offices and retail, River City 3 combines amazing interiors, ground-level retail and amenities, and an incredible location. 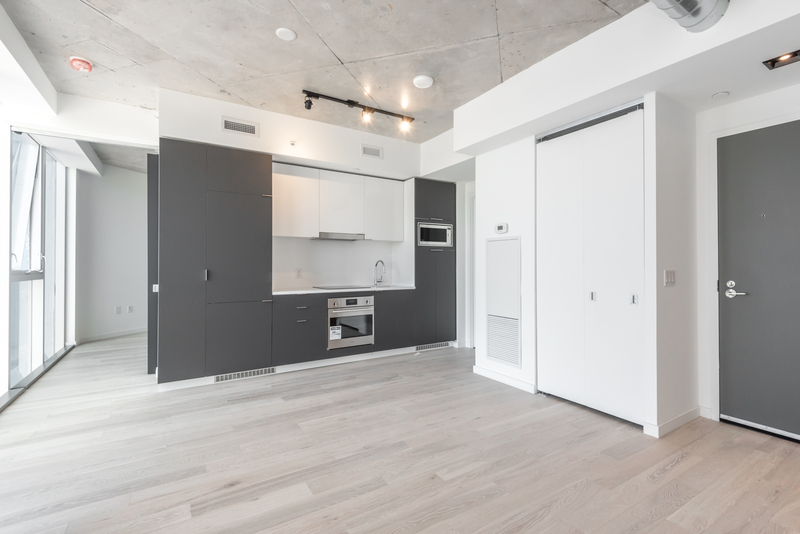 Unit 512 fuses open-concept with industrial elements. 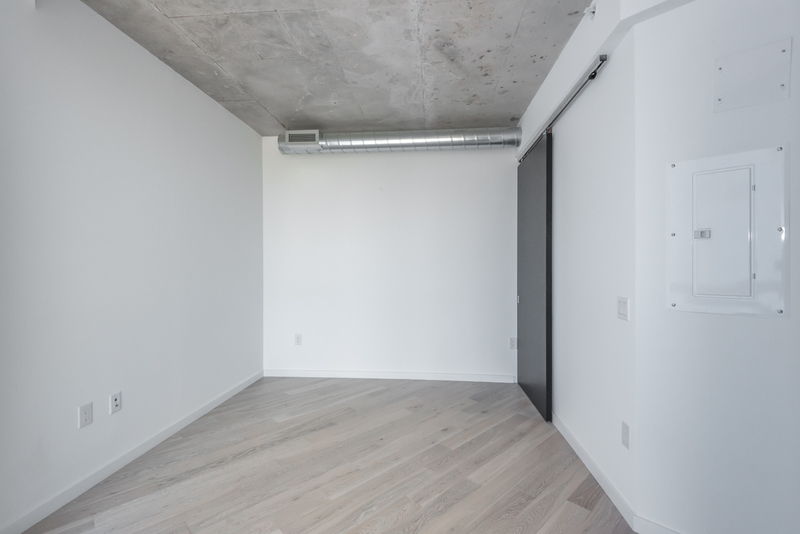 At a spacious 557 square feet, River City 3 consists of a large bedroom, a washroom and an office nook. 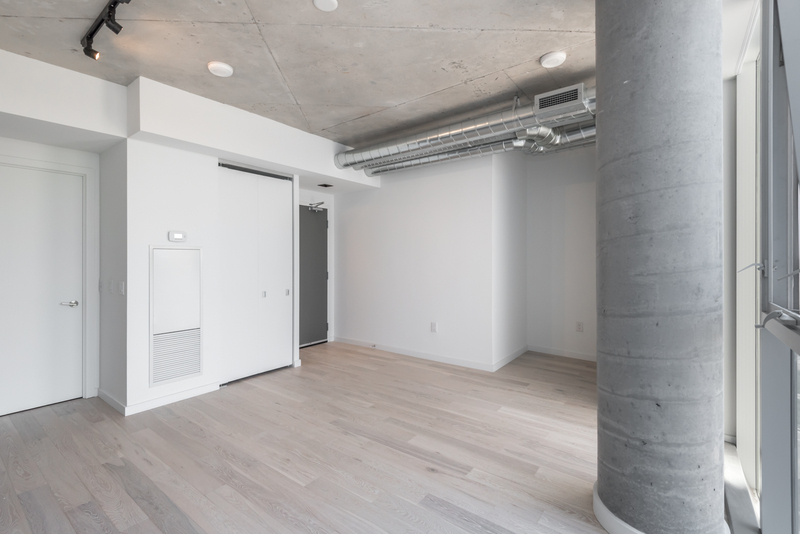 Laminate floors add luxury, while industrial materials like steel and concrete amplify the urban look. One of the unit’s greatest highlights is the dining room. Because it’s right next to some massive windows, residents can enjoy stunning park views with every meal. Start your day with breakfast and sunshine. Meanwhile, the spacious living room also has a great view and a closet for all your storage needs. The closet blends seamlessly into the white background. There’s also a nook with a phone-jack and outlet for any work-related activities. 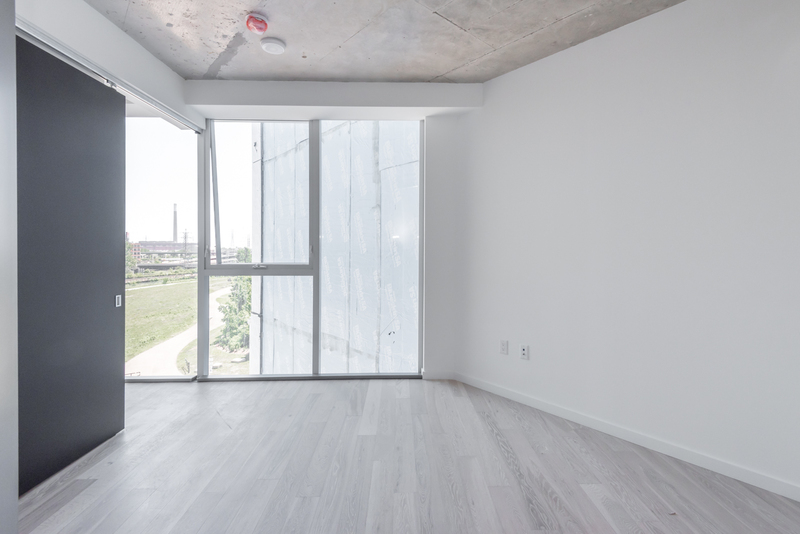 Plus it’s got a great view of Corktown Commons. A small desk and chair can transform this nook into an office or study. 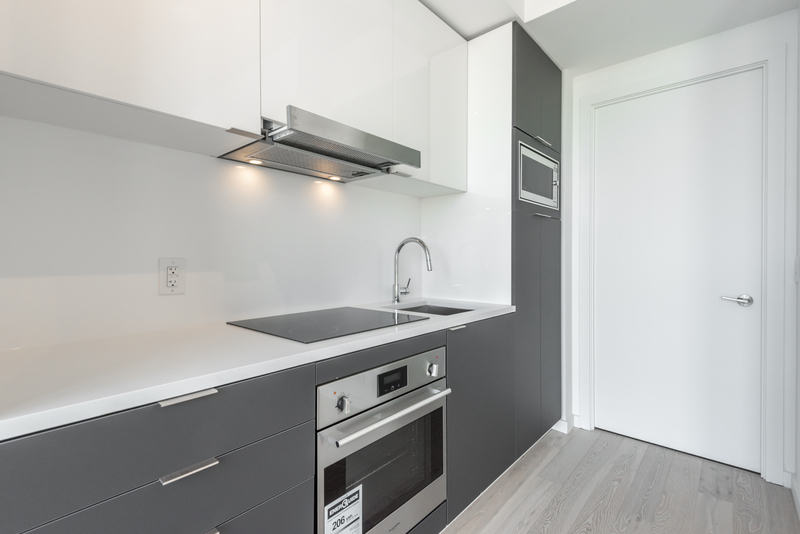 Outfitted with stylish European appliances, River City’s kitchen is beautiful yet functional. 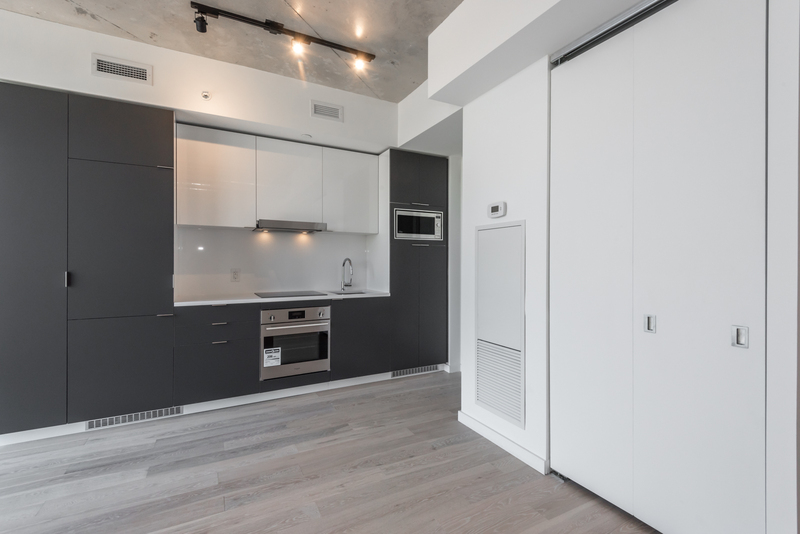 For example, the use of recessed appliances saves space while contrasting colours give it a visual flair. Furthermore, track and under-hood lighting provide practical sources of illumination. At the same time, they cast a charming glimmer on the polished back-splash and glossy cabinets. Note the powerful contrast between the white and dark cabinetry. The master bedroom is accessible via a sliding door, allowing for greater privacy. River City 3’s master bedroom fuses form with function. Laminate floors and exposed piping add style, while high-ceilings, large windows and a huge walk-in closet provide sensible functionality. These floor-to-ceiling windows offer fantastic views and plenty of sunlight. Another highlight of the master bedroom is the walk-in closet. Not only is it incredibly spacious, but it’s brilliantly lit from the inside by track-lighting, and from the outside by several enormous windows. An unbroken row of windows means better views and illumination from every room. River City’s washroom is aesthetically elegant, with green and gray tiles, clean, geometric lines, and a gorgeous mix of monochromes. It’s also very efficient. 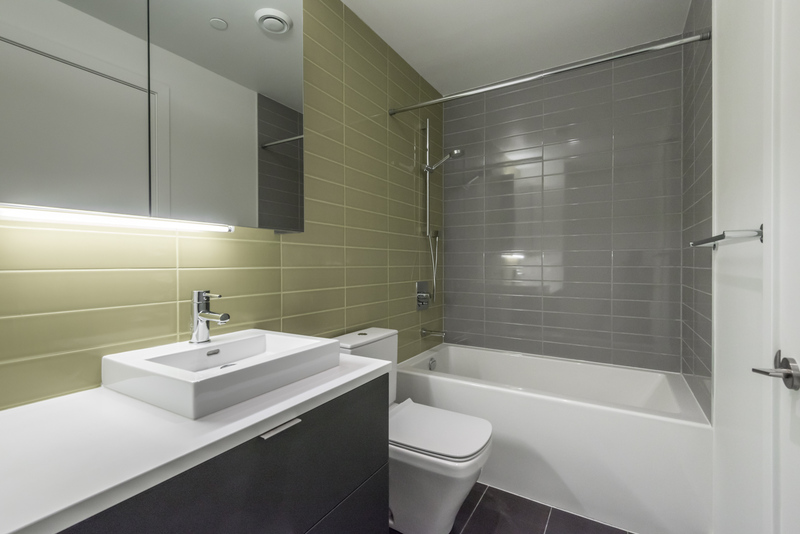 Besides a shower and tub, it features back-lit medicine cabinets, dual-flush toilets, and water-saving faucets. Storage space is not an issue since the bathroom has two drawers and a medicine cabinet. 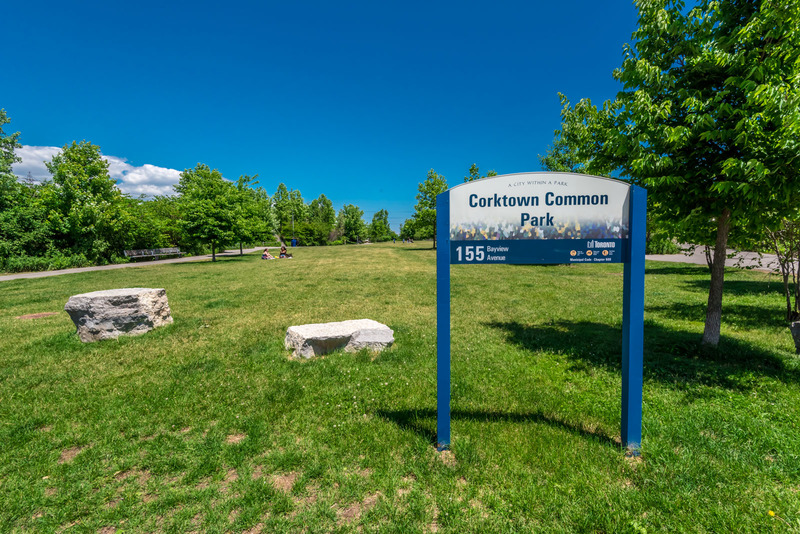 Corktown Common Park—the perfect green-space for the perfect condo. 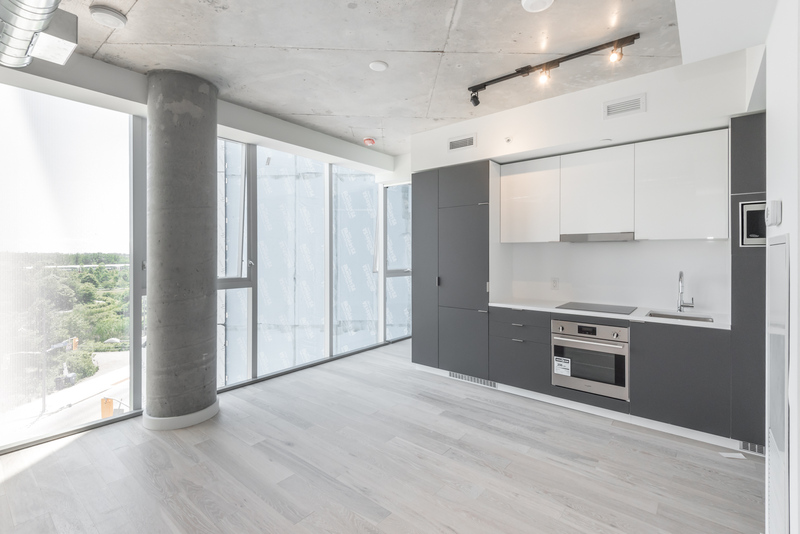 Like the condo itself, River City’s amenities are a mix of luxury and practicality. 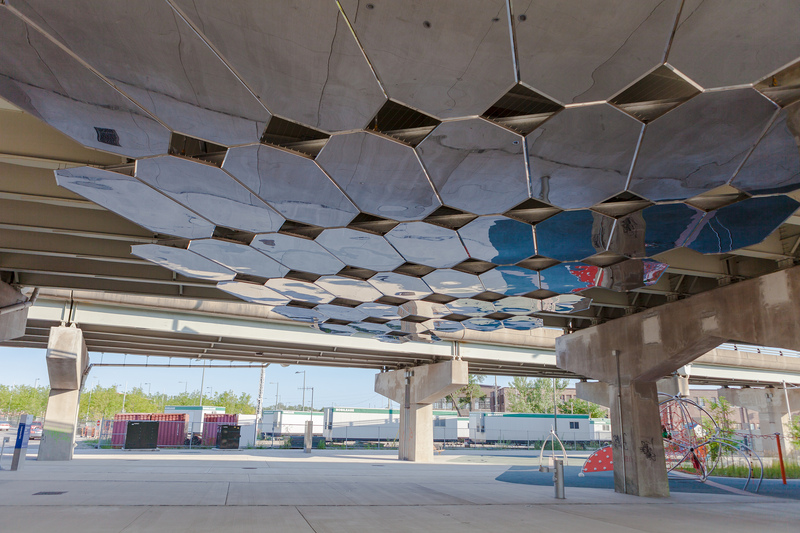 Corktown is a highly-diverse neighborhood, with cafes, greenery and public art all sharing the same space. 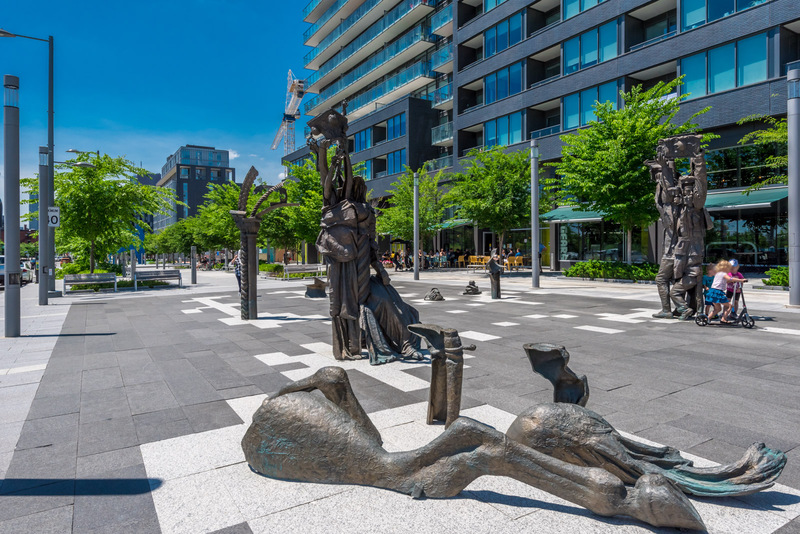 River City is surrounded on every side by green-space, including Corktown Common, Lauren Harris Square, Don River Valley Park, and Underpass Park. Each is unique in its own way. 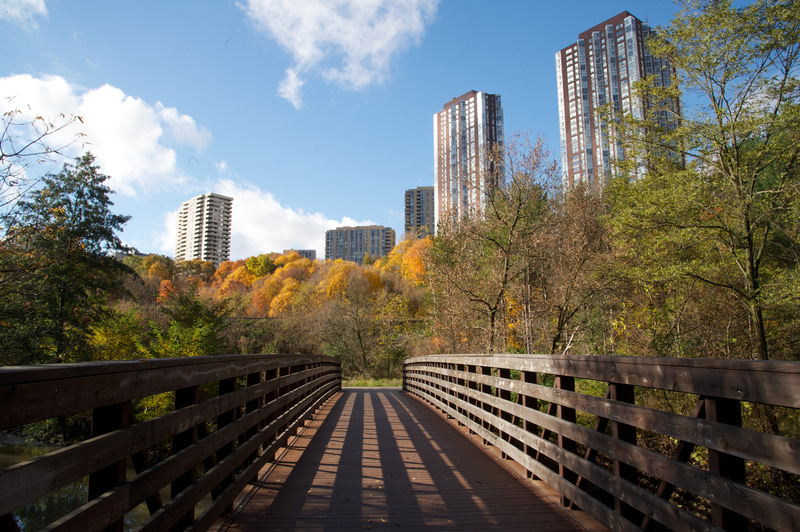 For example, the 200-hectare Don River Valley Park is home to a variety of wildlife, including foxes, deer, beavers, and great blue herons. Plus it has some fantastic hiking trails. Or take the $6 million Underpass Park. Unlike the former, it emphasizes urban elements rather than natural. 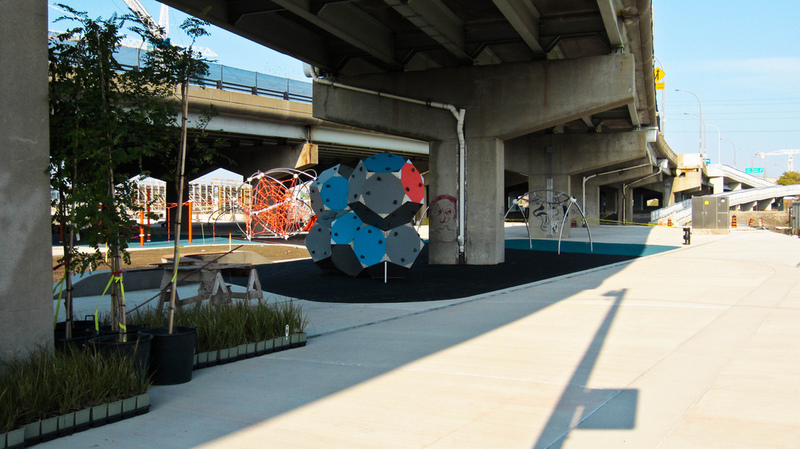 Underpass Park is literally under a highway, giving it a fun, modern edge. 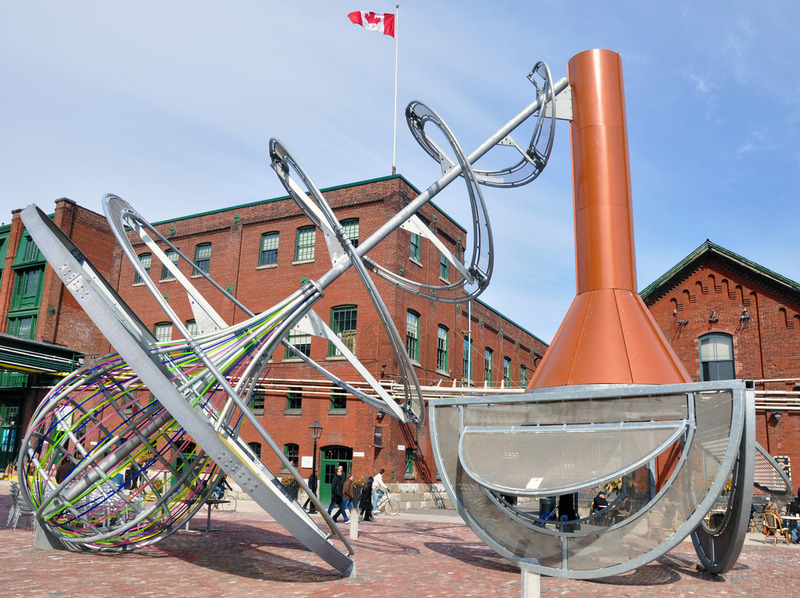 The park also features public art displays composed of man-made materials like stainless steel and LED lighting. 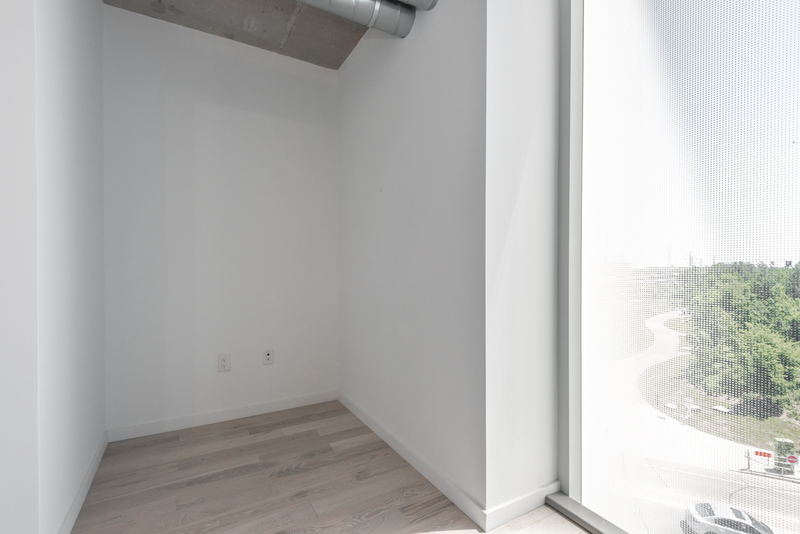 In addition to green-spaces, River City 3 is only a few minute’s from the Don River, Lakeshore, and Sugar Beach. 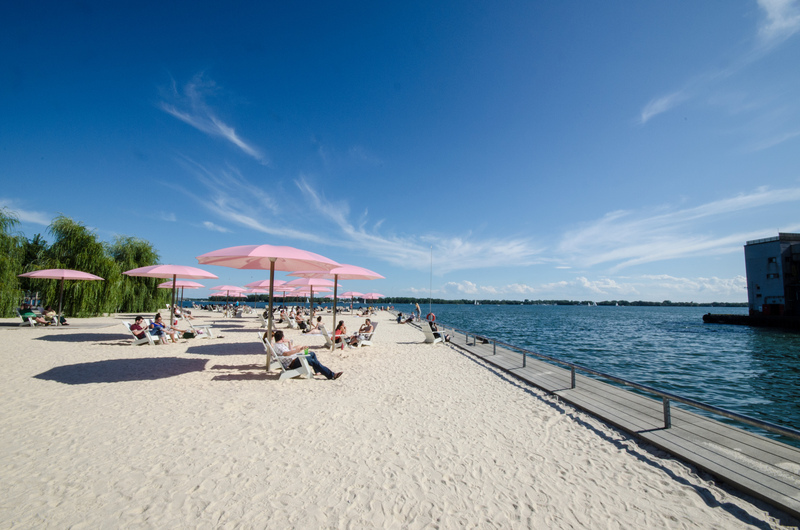 Sugar Beach is a great place to unwind after work, ride your bike, or walk your dog. So nature-lovers have plenty to enjoy, whether it’s hiking, biking, fishing, or relaxing on a sunny beach. 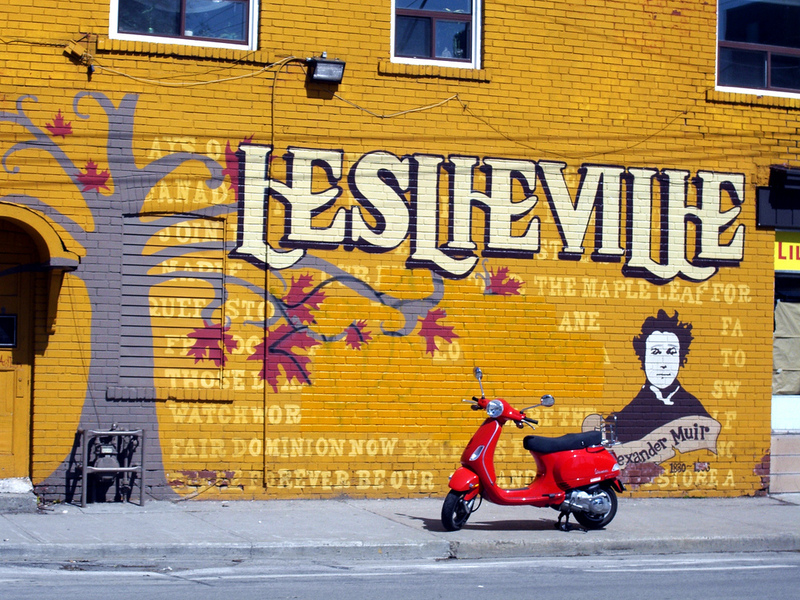 Living at 170 Bayview Avenue means being at the centre of an exciting urban renaissance. The West Don Lands is undergoing a massive transformation, with amazing new retail, restaurants, schools and businesses. And with beaches, rivers and the 18-acre Canary Common Park right outside your doorstep, RC3 is the perfect escape for busy professionals. Want to learn more about River City 3? Contact me below for more details.